Work continues on the new Colyer-Fergusson centre for Music Performance, and here’s the latest pictures, courtesy of Tim Ronalds Architects. 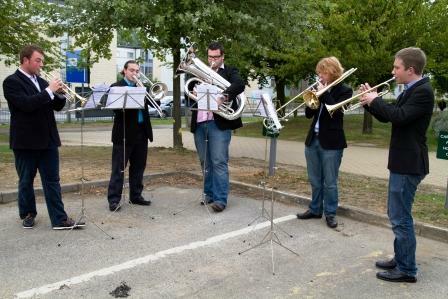 To the heraldic sound of a brass fanfare from some of the University’s musicians, the first hole was symbolically dug for the new Colyer-Fergusson centre for Music Performance on May 27th, and last week work began on this exciting new venture. After the process of planning, things are finally (if you’ll pardon the pun) taking concrete form, and the wheels are turning to bring the dedicated performance and rehearsal space from off the page and into reality. The ceremonial digging of the first hole marked the first real moment where the project begins to develop a tangible reality: from here onwards, there will be visible signs of the new building’s ascent as it becomes a landmark on the University campus. Present at the ceremony were the Honourable Jonathan Monckton, Chairman of the Colyer-Fergusson Charitable Trust, seen here wielding the spade, as well as supporters of the project including members of R Durtnell and Son, the construction company, fresh from their recent success in building the new Turner Contemporary Gallery at Margate. 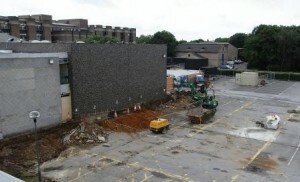 The building will be completed in the summer of 2012, and will house the ever-growing range of music-making opportunities for students, staff and the local community and beyond. More details on the event can be found on-line here. The last photo here (taken earlier this week), captures the very first excavations: for all those who have wallowed in the soupy acoustics of Eliot College Hall, or traversed the Stygian depths of the main colleges to find the College practice rooms, this is a sign of better things to come! After a lull of nearly a year whilst all the project details and infrastructure were put in place, finally there’s some exciting news about the new Colyer-Fergusson centre for Music Performance from over the past two weeks: keep an eye on this column early next week for news about the start of the project, and pictures of various people wielding a silver spade and some brass players performing (those two details are not directly connected, you understand…!). The near-complete version of the Colyer-Fergusson centre for Music Performance model made the trip from London to Canterbury last Friday, unscathed, in a Golf. 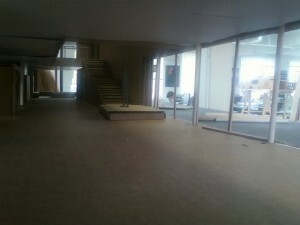 The hall itself is now fully realised, as is the reception foyer with its performance stage and enjoining social space. You start to get a real sense of what it will feel like to sit in the audience seating (pictured to right), with the breadth of window on the west wall and recessed aperture in the roof admitting plenty of light. 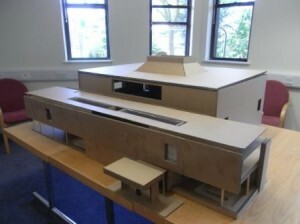 The model also gives a sense of how the interior spaces relate to one another and lines of sight: from the social space, there’s a view straight down the length of the foyer, whilst someone on the foyer’s performance stage can see through the doors and into the main hall. It also begins to give a sense of the exterior of the building: not yet present in the realisation is the north section, with the practice rooms on the ground floor and suite of offices and rehearsal rooms on the upper floor. It’s starting to get very exciting indeed! 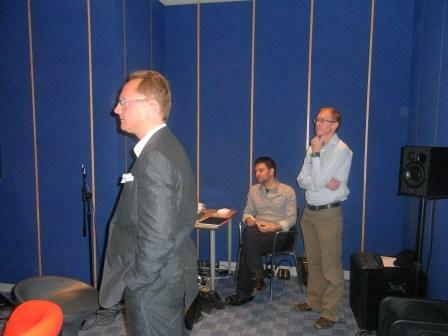 Feed your anticipation by viewing the gallery of photos taken at the meeting. 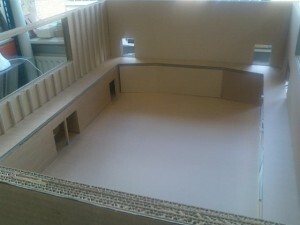 Another hot day last Friday saw us travelling to Tim Ronalds Architects in London to discuss plans for the seating in the new Colyer-Fergusson centre for Music Performance, as well as to see early incarnations of the model of the new building. This is a truly exciting moment: when the two-dimensional paper plans begin to translate into a three-dimensional representation of the building, and you start to get an idea of what the all the plans, meetings and discussions have actually been driving towards. The model of the foyer, with its small performance stage, viewing balcony, social area and lobby (pictured left) gives a real sense of the interior which will greet visitors as they arrive. Musicians on the small foyer stage will be at the focus of the reception area, and viewers on the balcony will be really involved with the performance. The social area in the corner will be a suitable place to listen to music, catch up with e-mails (or up-date your Facebook status on your phone!) whilst waiting for rehearsals and concerts in the main hall to begin. The glass wall running the length of the foyer’s external east wall will offer enticing views to passers-by and those walking up to the building, of small chamber music performances on the foyer’s stage or audiences congregating before entering the hall itself. 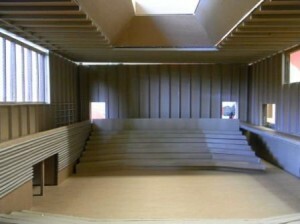 Early designs for the concert-hall (pictured below) also show the great flexibility that the space will afford: without the modelling of seating, you get a great sense of the performance space itself, with the surrounding balcony. More photos of the finished model will follow in the next few weeks, but to whet your appetite, here’s a brief selection of photos from Friday’s early stages. The new building: are you listening ? 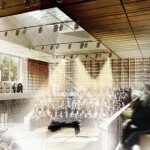 Last Friday, we heard the interior of the proposed Colyer-Fergusson centre for Music Performance. Not literally, alas: but virtually. Rising with the lark (actually, before the lark: I had to shoo him out of bed), and then up to London to meet with project members from the University and representatives of Tim Ronalds Architects and Carr and Angier Theatre Consultants at the London offices of Arup Acoustics, where acousticians were modelling the sonic interior of the building. Sitting in the centre of a small sound-booth, we were presented with various ensembles – orchestra, choir, string quartet, brass ensemble, solo singer and continuo – recorded anechoically, and then heard their performances realised in a virtual sonic model of the new building’s interior. The great strength of the proposed building is that it is a flexible performance space. It will be able to change in order to accommodate a diverse range of performing ensembles, from full symphony orchestra and chorus to chamber choirs, big bands, string and brass ensembles., We explored the various permutations of the variable acoustics – fully reverberant, then with varying degrees of the acoustic drapes being set to render the acoustic gradually less reverberant – with different ensemble set-ups, and assessed the differening impacts of the acoustic settings on each. Potentially, the sonic space created by the hall, and the varying acoustic properties offered by the variable acoustics, are fantastic, and afford a wide array of opportunities for ensemble music-making, ranging from the large scale to the intimate, each with a suitable (almost bespoke) acoustic environment. The nature of the reverberation within the hall will be able to be altered to suit the different types of rehearsing and performing, tailored to meet the demands of the varying ensembles using the space. It is unquestionably a fantastic space for music-making, and we are highly excited. We’ll keep you posted as further developments unfold: keep your ear to the ground. 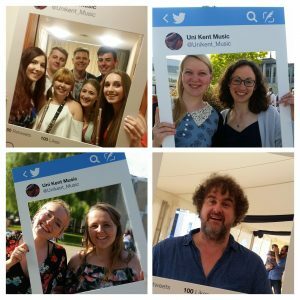 I’m delighted to report that, after months of development, modernisation of the department continues: the new Music Department website at the university has just gone live! Seeing the future: the new-look website. Those of you familiar with the previous incarnation will, I hope, be pleased with the new site’s look and feel: it’s now more interactive, visually more engaging, and less page-scrolling is required to view content as it journeys down the page. New features include embedded video and virtual brochures, with the possibility of additional enhanced features to reflect the Music Department itself as it heads into the next decade with the exciting new music building mentioned previously here on the blog. A new News and Links feature will allow us to keep visitors up-to-date with stories and events, and keep the site relevant with current content to keep readers coming back. It still offers the same facilities as before, including the Concert Diary (now presented much more usefully) and down-loadable seasonal brochure, details about ArtsFest, plus all the music-making activities and ensembles with which to get involved. Still under development is an attractive dynamic gallery, where photos from recent events will be published: a feature sorely missing from the previous site. The new, sleeker and (hopefully) sexier website is here: view it for yourself! 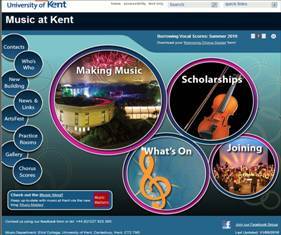 Building the future: music at Kent. Exciting times for music at the University: in more ways than one. The project for the new Colyer-Fergusson Centre for Music Performance is developing apace, in conjunction with the award-winning firm of Tim Ronalds Architects: we’ll be keeping you posted (literally) as to how the project is unfolding right here on ‘Music Matters,’ from clod to concert-hall. The brochure for the new building is also now available, and I’m delighted to be able to present it here in what is a first for the Music Department: literature in an e-zine format. Click here to download a copy of the brochure, or here to find out how to become involved in the project.